1. Vitamin deal: Procter & Gamble (PG) announced Thursday it is buying the consumer health business of German pharmaceutical company Merck KGaA (MKGAF) for about €3.4 billion ($4.2 billion). P&G said the deal will help it expand its vitamin and health supplements business, giving it broader geographical reach and Merck brands such as Seven Seas and Nasivin. Shares in P&G nudged higher in extended trading. The company will report its results before the market opens on Thursday. P&G also announced it will end its consumer care joint venture with Teva Pharmaceutical Industries (TEVVF) in July. Merck shares were trading higher in Frankfurt on Thursday. UBS analysts said the price P&G agreed to pay for the business was "better than expected." 2. AT&T-Time Warner: The spotlight is turning to the chief executives in the antitrust trial that will determine the fate of AT&T's (T) $85 billion bid to acquire Time Warner (TWX). AT&T CEO Randall Stephenson is expected to testify on Thursday. Time Warner CEO Jeff Bewkes made the case for the proposed merger on Wednesday, arguing the deal is the only way for Time Warner to be able to compete with tech giants such as Google (GOOGL), Facebook (FB) and Amazon (AMZN). AT&T announced its intention to acquire Time Warner, the owner of CNN and CNNMoney, in October 2016. But the Justice Department threw a wrench in those plans when it sued to block AT&T's bid in November. 3. Amazon Prime boom: Shares in Amazon (AMZN) jumped higher in premarket trading after its CEO Jeff Bezos revealed Wednesday the company now has more than 100 million Amazon Prime subscribers around the world. 4. Qualcomm's Chinese hurdle: China's Commerce Ministry warned Thursday that the antitrust remedies Qualcomm had proposed for its planned $44 billion purchase of rival chip maker NXP Semiconductors (NXPI) may not be enough to "solve the relevant market competition issues." China is the last country where the deal still faces regulatory hurdles. The announcement comes just two days after the United States banned ZTE (ZTCOF), one of China's biggest tech companies, from buying components from American firms, including Qualcomm. 5. 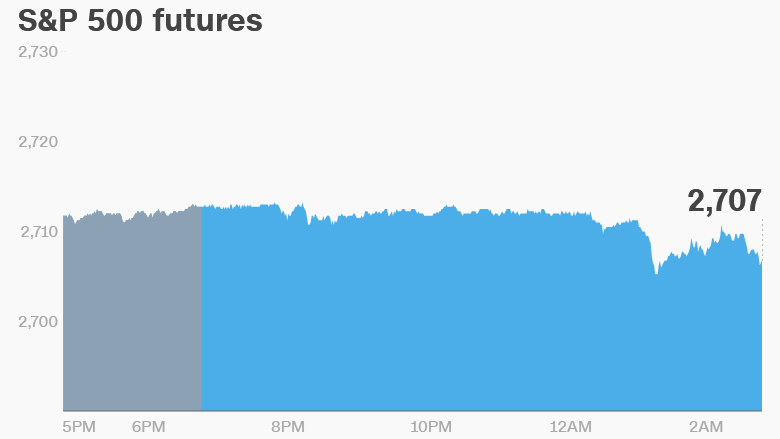 Global market overview: US stock futures were lower early on Thursday. European markets opened mixed, following a positive trading session in Asia. The Dow Jones industrial average slipped 0.2% on Thursday, while the S&P 500 closed 0.1% and the Nasdaq gained 0.2%. US crude futures jumped 1% on Thursday, after soaring 3% Wednesday. A report on Wednesday showed US crude oil stockpiles fell more than expected. Oil was trading at $69.2 per barrel, the highest since late 2014. 6. Earnings and economics: Blackstone Group (BX), Bank of New York Mellon (BKPRC), Novartis (NVS), Philip Morris International (PM) and Procter & Gamble (PG) will report their earnings before the opening bell on Thursday. US initial jobless claims report will be published at 8:30 a.m. ET. Japanese inflation data will come at 6:30 p.m. ET.